By Eugene Tay, the director of Green Future Solutions, a business that promotes environmental awareness and action for a green future through sustainability consultancy and a network of green websites. In breakthrough talks late last year, the Singaporean government and Malaysia agreed on a revised land swap deal involving the KTM (Keretapi Tanah Melayu) Railway Lands. These are the vast green areas in Tanjong Pagar, Kranji, Woodlands and parts of Bukit Timah, a combined space that is almost three times the size of the Botanical Gardens and about 0.24% of the entire land mass of Singapore. Parceling out the land as a real estate would mean sacrificing the remains of the railroad, and the lush greeneries around it. The Nature Society of Singapore (NSS) has proposed that these instead be preserved. 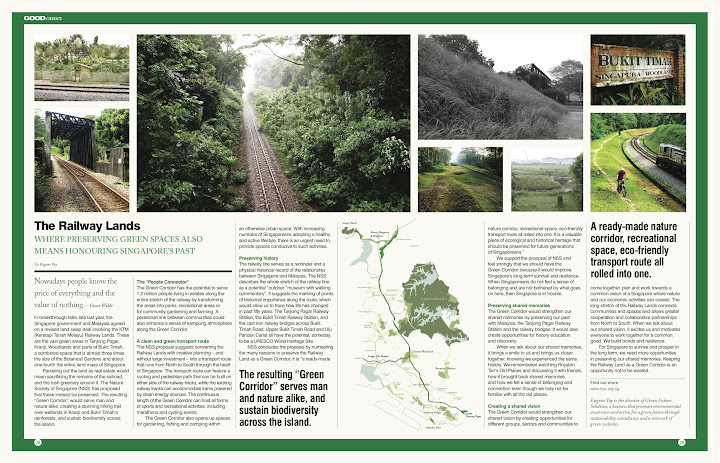 The resulting “Green Corridor” would serve man and nature alike, creating a stunning hiking trail over wetlands in Kranji and Bukit Timah’s rainforests, and sustain biodiversity across the island. The Green Corridor has the potential to serve 1.2 million people living in estates along the entire stretch of the railway by transforming the areas into parks, recreational areas or for community gardening and farming. A pedestrian link between communities can also enhance a sense of kampung atmosphere along the Green Corridor. The NSS proposal suggests converting the Railway Lands with creative planning – and without large investment – into a transport route that runs from North to South through the heart of Singapore. The transport route can feature cycling and pedestrian paths that can be built on either side of the railway tracks while the existing railway tracks can accommodate trams powered by clean energy sources. The continuous length of the Green Corridor can host all forms of sports and recreational activities, including marathons and cycling events. The Green Corridor also opens up spaces for gardening, fishing and camping within an otherwise urban space. With increasing numbers of Singaporeans adopting a healthy and active lifestyle, there is an urgent need to provide spaces conducive to such activities. The railway line serves as a reminder and a physical historical record of the relationship between Singapore and Malaysia. The NSS describes the whole stretch of the railway line as a potential “outdoor museum with walking commentary”. It suggests the marking of points of historical importance along the route, which would allow us to trace how life has changed in the past fifty years. The Tanjong Pagar Railway Station, the Bukit Timah Railway Station, and the cast iron railway bridges across Bukit Timah Road, Upper Bukit Timah Road and Ulu Pandan Canal all have the potential, someday, to be a UNESCO World Heritage Site. We support the proposal of NSS and feel strongly that we should have the Green Corridor because it would improve Singapore’s long-term survival and resilience. When Singaporeans do not feel a sense of belonging and are not bothered by what goes on here, then Singapore is in trouble. The Green Corridor would strengthen our shared memories by preserving our past with Malaysia, the Tanjong Pagar Railway Station and the railway bridges. It would also create opportunities for history education and discovery. When we talk about our shared memories, it brings a smile to us and brings us closer together, knowing we experienced the same history. We remembered watching Royston Tan’s Old Places and discussing it with friends, how it brought back shared memories and how we felt a sense of belonging and connection even though we may not be familiar with all the old places. The Green Corridor would strengthen our shared vision by creating opportunities for different groups, sectors and communities to come together, plan and work towards a common vision of a Singapore where nature and our economic activities can coexist. The long stretch of the Railway Lands connects communities and spaces and allows greater cooperation and collaborative partnerships from North to South. When we talk about our shared vision, it excites us and motivates everyone to work together for a common good. We build bonds and resilience. 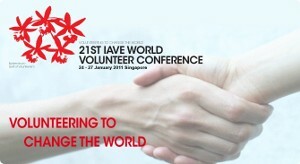 For Singapore to survive and prosper in the long term, we need more opportunities in preserving our shared memories. Keeping the Railway Land as a Green Corridor is an opportunity not to be wasted. Thanks for posting this article on The Green Corridor! Enjoying the revamped Good Paper so far, keep up the good work. 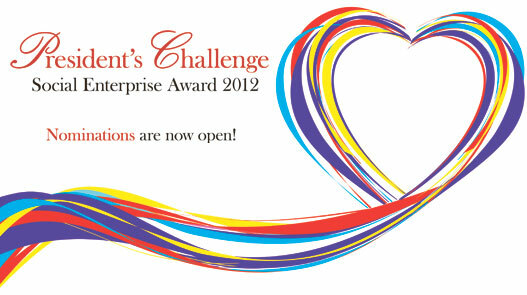 And remember to show support for The Green Corridor at http://www.fb.com/thegreencorridor. Thanks!